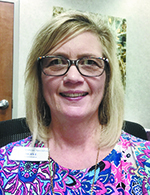 "It wasn't the first time he's been angry here," says Cheryl Keith, administrator for the practice located on the Brookwood Medical Center campus. "He's been abusive in the past. This time, he talked about violence." He was frustrated about his insurance coverage and wanted the front desk to submit his claims for him to the supplemental plan. "He was trying to bully them into filing that second insurance, and he blamed the front desk for his having to pay a copay," Keith says. "He was so intense that another patient in the waiting room videoed it." For several minutes, the man yelled and cursed. Then he told the women they were lucky he was not a violent man. They managed to tamp down his anger enough to gather his copay and move him on. But as the nurse escorted him back to the exam room, he commented about shooting up the front desk. She left him with the doctor and headed to Keith's office to relay his aggressive statements. Keith talked with the front desk employees who were afraid. She also knew, at the end of the exam, the doctor had already planned to terminate the patient's relationship with the practice based on past outbursts. She decided to alert security about the verbal threat, and then informed the doctor. About five minutes later, ten Homewood police officers charged through the front office in full tactical gear with guns out, locked the front doors, shut down the office, and rushed to the exam room. "It scared me," Keith says. She was only expecting a few building security officers. "But they were totally prepared. I was proud of the way those officers handled it." The police restrained the patient on the floor and questioned him. After interviewing others involved, they had Keith write the dismissal letter and present it to the man. "They told him he is not allowed on the campus of Brookwood or any Tenet premises," Keith says. "If he did, 911 would be called, and he would be escorted off. "What was even more bizarre was that about half of the officers were called away during our situation to a shooter at a nearby Walmart." After a half-hour interviewing witnesses and collecting written statements, the officers released the man with the warning. They also told Keith they offer free in-office training on handling active shooters. A few weeks later, all 40 practice staff members and 11 physicians participated in an hour-long training session with the Homewood police. Held in the practice waiting room, the officer presented videos of real active-shooter situations and had staff role play scenarios. The officers later conducted a longer training session for Brookwood hospital staff where they closed off a wing and incorporated mock gunfire. The active-shooter training focuses on staying alive. "You fight to live," says Detective Gabe Ferguson with the Homewood Police Department. "First, you run. Don't try to assess the situation or talk to the shooter. Instead of hiding under a desk and being easy prey, run to a place where you can deny them access. Put a filing cabinet in front of the door or tie the doorknob to something so they can't open it all the way." Keith says their trainer told them to buy simple rubber stoppers for each exam room to jam beneath the door from the inside. "You only need to buy time," she says. "Get enough time for the people to arrive who can take that person out." An officer also assessed their facility, suggesting tactics like adding keypad locks to several doors to restrict easy access. Ferguson cites the average response time for active-shooter calls at about four minutes. "That's a long time if someone is shooting at you," he says. "But even if you have 30 seconds, you should be able to get into a room and secure it." On auto-close doors, he says, like in public restrooms, wrap the elbow-shaped, metal hinge at the top with a belt or computer cable to prevent it from moving and opening the door. "After the training, everybody felt a little safer and a little more aware," Keith says. "They're also more aware of reporting these things quickly now. There's no more asking, 'should I?'" Several of the physicians took the self-defense classes held by Homewood police, as well. "This is not becoming a normal call for us," Ferguson says. "But that could be because people aren't taking the threat seriously." Keith agrees. "The problem today is nobody is called out on their verbal threats and they get more confident about acting on that threat," she says. "We need to tell them that we're going to take them at their word; that nobody will even tolerate the possibility of violence."